Simmer for a few minutes mixing all the time. 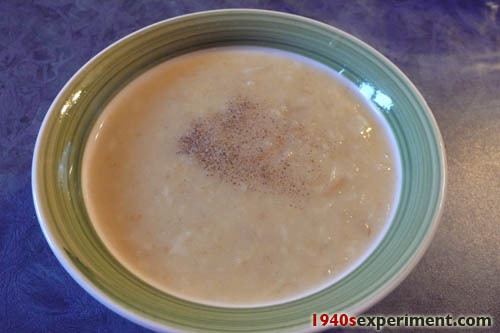 This entry was posted in Uncategorized and tagged cream of parsnip soup. Bookmark the permalink. Marvelous! I was looking for a recipe for parsnips. Hey Kegs- much to my dismay they did use curry powder in some recipes from 1940s… I have found several recipes! I don’t think it was one of the more commoner spices but they DID use it!!! Roll on curry spiced soup!!! I have made curried parsnip soup and it is amazing and filling too….With a nice wholemeal roll it makes a fantastic lunch!!! Made this last night. Added in a couple of slices of feta cheese and then stick blended it all. It was DIVINE!!! And the great thing is I still have enough left for another few meals!